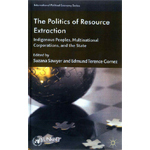 Korinna Horta, in UNRID, The Politics of Resource Extraction. The World Bank-supported Chad-Cameroon Oil & Pipeline project would leverage a much larger private sector investment by the consortium led by ExxonMobil. This article shows how private-public partnerships (PPPs) mostly leave local populations living along the pipeline, including Cameroon’s indigenous Pygmy communities, further impoverished, with the forests from where they obtain the bulk of their livelihoods destroyed.